Hice este wallpaper porque me encanta "Poker Face" de Lady Gaga @__@ es una canción tan pegajosa, si no la has oído, aunque no creo xD tienes que oirla! I made this wallpaper 'cause I like "Poker Face" by Lady Gaga @___@ it's a so catchy song, if you've not listened it, you must do it! Wait there it is, why couldn't I see it just a second ago? You know I made a post here that the artist replied to, (indicated by the automatic notification I received) but now I can't find the post I made nor the reply here on the actual image page. Where did it go? Is this part of the normal DA system that comments that are replied to can not be viewed by the original comment poster? Cool anime version of her. You should also do anime versions of Selena Gomez and Miley Cyrus. thank u! but i think isn't a big deal... it's just a fanart of my fanart xD thank u anyway! She's adorable ! a friend draw to me exactly same. 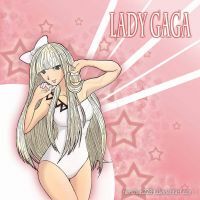 I think Lady Gaga's supercool! I got addicted to Lady Gaga because of Eric Cartman sang it in Rockband, Damn that fatass. I know I'm hoping my friend brings her Lady Gaga CDs so I can put them on my iPod Nano. no prob. I love lady gaga! Poker face is my fav. Whats your?? never heard it. Shoot. What other songs do you like that i might know. cause my mom tells me these people i never heard of! Adorable - you make her look so CUUUUUTE~~ The pose is just lovely - and she just looks so happy - great work! Lady Gaga Rules The Universe!!! !